50,000+ Best Quality SEO friendly Visitors for your WEBSITE for just $20 ! Here we will provide 50K traffic spread for 7-10 days in default. if you want to change spread days then please mention the days in order requirement clearly. You can target upto 5 keywords in Basic Package and upto 10 keywords in EXTRAS. According to the packages you can request spread days as you want and you will have continuous traffic for whole day. You can provide many sites to split total traffic but it should be 1 link per $2. If you want to target any specific country other than USA then you have to place order please add extra minimum 70$ or more. 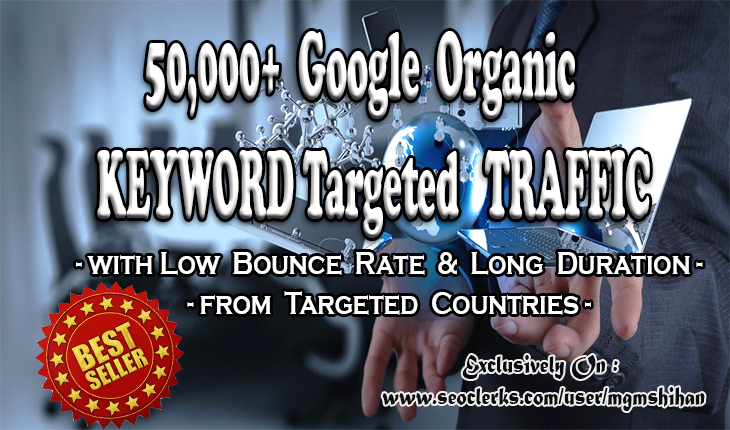 50K KEYWORD Targeted Google organic Traffic is ranked 5 out of 5. Based on 34 user reviews.